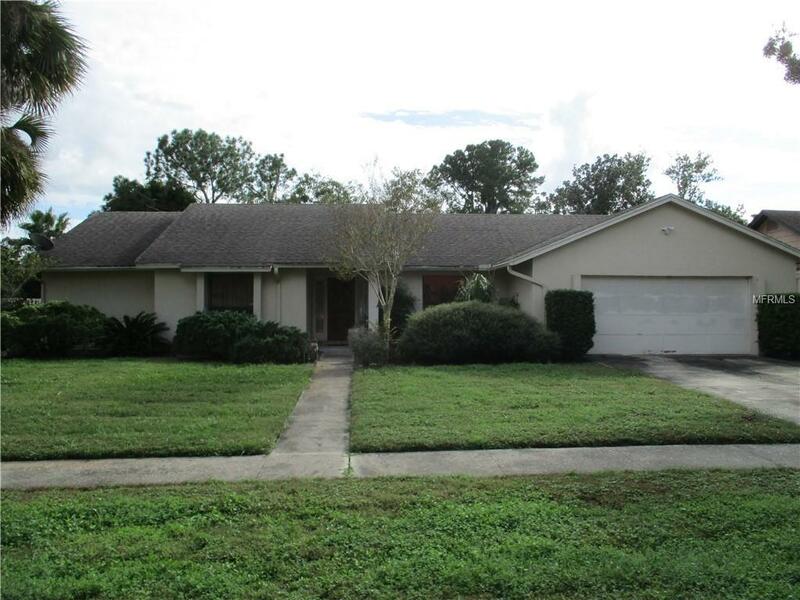 Fantastic opportunity in The Cove at Lake Mira....This roomy one story 4 bedroom 2 bath home has loads of potential, it's located on a peaceful and quiet dead end street with convenient access to 417 and UCF. It has a large back yard that is perfect for family activities and pets and best of all has no rear neighbors!... The split bedroom floor plan features a large step down living room with vaulted ceilings and a magnificent stone fireplace that is framed by 2 sliding glass doors that lead to the huge screened in lanai that overlooks the back yard. The spacious formal dining room has easy access from the large kitchen that provides ample room for an eat-in area. The master suite has sliding glass doors that lead to the lanai and features a large walk in closet and a mirrored counter and sink outside the master bathroom that has a unique step down bath tub and separate shower. The Cove at Lake Mira is a lovely family neighborhood and is zoned for Glenridge Middle and Winter Park High School district and has a very low HOA. Listing provided courtesy of Coldwell Banker Ackley Realty. © 2019 My Florida Regional Multiple Listing Service, Inc. All rights reserved. All listings displayed pursuant to IDX. All listing information is deemed reliable but not guaranteed and should be independently verified through personal inspection by appropriate professionals. Listings displayed on this website may be subject to prior sale or removal from sale; availability of any listing should always be independently verified. Listing information is provided for consumers personal, non-commercial use, solely to identify potential properties for potential purchase; all other use is strictly prohibited and may violate relevant federal and state law. Data last updated 2019-04-25T19:41:17.23.